I am drawn to sacred sites not because I know those places, but because I believe the places know me. There are certain instances in life where experiencing something in person is more overwhelming than any of the advance research into it could’ve predicted. Rounding a bend on Route 385 in the Badlands to see the massive face on the Crazy Horse Monument 600 feet above the valley floor is one. Another is the interior of the Baha’i Temple near the lakeshore in Evanston, IL. Then there’s the Mayan pyramids of Tikal in Guatemala, the Wat Phra Kaew in Bangkok, St. Peter’s Cathedral in Vatican City, Stonehenge west of London, and the Pyramid of the Sun at Teotihucan in Mexico, to name a few. That same sense of awe and wonder was also the case when seeing the magnificent Sagrada Familia Basilica in Barcelona two months ago. 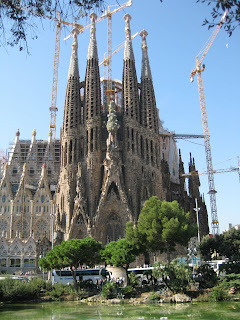 La Sagrada Familia was originally conceived by the Catalan publisher Josep Bocabella as a work of expiation for the city's increasingly revolutionary ideas. Work began in 1882 by public subscription on a design by architect Francesc de Paula Villar, which proposed a simple church in a traditional neo-Gothic style. After arguments between Bocabella and Villar, Antoni Gaudí took over as lead architect in 1884. Gaudí immediately changed the project completely, seizing the opportunity to express his strong religious and nationalist feelings. After finishing the fantastical Parc Guell in 1911, Gaudí vowed to abandon secular art and devote himself entirely to the Sagrada Familia. He worked on it tirelessly for over forty years, living as a virtual hermit in a workshop on the site. When questioned about the slow pace, he is said to have replied, "My client is not in a hurry." Nevertheless, it remained unfinished at Gaudí's untimely death in 1926, when the artist was run over by a tram on the Gran Via. He died in hospital two days later and was mourned by all of Catalonia. He is buried in the crypt of the Sagrada Familia. Work on the project continued after Gaudí's death under the direction of Domènech Sugranyes but was interrupted by the outbreak of the Spanish Civil War in 1935. The building remained intact during the war, but in 1936 many of its models and plans were destroyed by Catalan anarchists, who saw the church as a symbol of the old, conservative religion that had no place in the new Barcelona. Construction began again in the late 1950s and has continued ever since. The current design is based on a combination of reconstructed versions of the lost plans and modern adaptations. Vaults over the side aisles were added in 1995 and the roof over the nave was finished in early 2001. The current director, Jordi Bonet i Armengol, began using computers for the design and construction process in the 1980s, which has sped up the complicated process considerably. 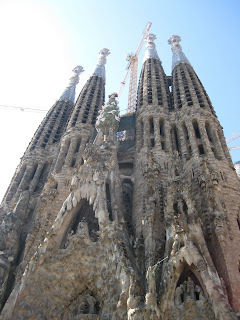 Still, the final stage of the grand Sagrada Familia is not progressing much faster than it did under Gaudi. Estimated completion date should be around 2026, the 100th anniversary of Gaudi's death. La Sagrada Familia is a striking example of Gaudi's unique Art Nouveau architecture and is filled with religious symbolism and meaning. Eight of the intended 18 towers have been built, which rise to over 330 feet (the height of a 30 story building). The towers represent the Twelve Apostles and each one bears the name and statue of its apostle. Gaudi also intended to add a 600 foot tower in the center (which will be taller than the Bellsouth “Batman” Building in Nashville), topped with a great cross representing Jesus. This will be surrounded by four shorter towers representing the Four Evangelists, topped with their animal symbols. A still shorter tower will represent the Virgin Mary. The height of the tallest tower is to be one meter less than the nearby hill, Montjuic, as Gaudi believed his work should not surpass that of God. The pinnacles of the towers are decorated with colorful mosaics and some are embedded with the words "Excelsis" and "Hosanna." The basilica has three facades, which are also filled with precise symbolism: the Passion Facade on the west; the Nativity Facade on the east; and the Glory Facade on the south. Each facade has three portals representing the virtues of Faith, Hope and Love. The Passion Facade on the west side, dedicated to the suffering and death of Christ, is nearly complete. It is decorated with striking, angular sculptures by Josep Maria Subirach (begun 1952). Its great doors, which serve as the main entrance, are printed with words from the Bible in various languages including Catalan; the word JESUS and select others are painted to stand out. The Nativity Facade on the east side, dedicated to the birth of Christ, was completed before work was interrupted in 1935 and bears the most direct Gaudi influence. The birth of Christ is depicted in the center, with the Adoration of the Magi on the left and the Adoration of the Shepherds on the right. Above is the Annunciation and Coronation of the Virgin Mary. High on the Nativity Facade us a spire with a cypress tree, symbolizing the tree of life. At the foot of the tree is a pelican and angels holding chalices, symbols of the Eucharist. At the top of the tree is a red Tau cross with an 'X' representing Christ's name and a dove representing the Holy Spirit. The bases of the facade contain sculptures of turtles, symbolizing the stability of the cosmos. The one closer to the sea is a sea turtle; the one closer to the mountains is a land tortoise. Gaudi was a true nature lover and spent much time studying it in the countryside. Inside the Sagrada Familia, areas will be dedicated to religious concepts such as saints, virtues and sins, and secular concepts such as the regions of Spain. Most of the pillars and flying buttresses are designed to look like trees spreading their branches into the ceiling above. You can take elevators to the top of the inside of the Nativity Facade and Passion Facade, or climb 400 steps. Once at the top, you can climb around the walls and into other towers and enjoy partial views of Barcelona through a jumble of latticed stonework, ceramic decoration, carved buttresses and a variety of sculpture. The temple is being financed exclusively from admissions into the site and museum, as well as private donations. No money from the Catholic Church has been given for its completion. The glorious paradox of no-nonsense faith. Anyone who has spent a few hours around Mark Hollingsworth knows his conversational references to culture, politics, the Good Book and the good fight span a really broad horizon. He has also led a truly fascinating life, and has the wit and word-smithing at his disposal to make his journey into a really entertaining read. Embracing the Gray is a delightful, sometimes dizzying account of Mark's adventures that demonstrates his gifts as a cultural commentator and a writer worth reading. Hollingsworth pulls no punches as he rolls through episodes of his life in the music industry and ministry to the poor, rubbing shoulders with rock royalty and desperately at-risk children, and coming of age between Vietnam and Van Halen. Having said all that, I've barely scratched the surface of the remarkable range of subjects he addresses with unflinching honesty-- and then draws a beeline to his faith, and how all that experience helped develop him into a truly authentic, thoughtful Jesus-follower. As pastor of a rowdy bunch of mostly Millennials (roughly 18-30 years of age), I am highly recommending Embracing the Gray to them because it provides them a wonderful tool: an example of how to think about faith, as opposed to simply what to think about faith. And to my Boomer contemporaries? Buy it for yourself. If you're a fan of Jesus, contemporary music, social action, Petra, Rush (the group; maybe not Limbaugh for this book), or needing to know that someone else has been through the pain of helping their parents shed the mortal coil with love and dignity, read this book. Then do your grown kids a favor and give it to them to read. (If you're sensitive to salty language, be warned that it makes an occasional appearance in this book. Thus the encouragement to make it available to your "grown children." But please, put some U2 on in the background and read it anyway. You really won't regret it.) -S.W. Honest, thoughtful, and inspiring. I am usually a fiction girl myself, so sitting down to read this type of book is a little out of my element, but, as I began to turn the pages I became thoroughly involved in the words. This book is an ever-changing story reminiscent of The Wonder Years and written in a style that brings to mind Douglas Adams and The Hitchhiker's Guide to the Galaxy. Both witty and insightful, melancholy and uplifting, this journey for truth gives you an honest look into the author's fascinating life. Wherever you are in your life, good, bad or indifferent, this book has something to tell you. -B.T. Deep waters but not without hope. I just read this book from Mark H. Really touching book. But not just sentimental way: Mark is writing with very strong foundation. If you have been in deep waters without hope then his book is for you. Life is not fair. Not after the Fall. But what are the alternatives if not Jesus. -J.S. I met Mark on a recent trip to Central America. He struck me as an ordinary guy with a wonderful, fun loving heart. Read his book after returning to the States and realized he is a gifted guy with an extraordinary story as well. I benefitted from his honesty in struggling with a mysterious God and thoroughly enjoyed the "vignettes" of his life that he poignantly shares with us. His writing style kept me coming back for more like a kid unwrapping presents at Christmas, surprised by what each box held. -T.D. It’s hard to comprehend that it was fourteen years ago that we learned Nashville was going to be granted an expansion franchise in the National Hockey League. Many naysayers, especially those north of the border, thought that this franchise would not only fail on the ice, but would subsequently leave Nashville within five years of inception. Neither could be farther from the truth. Here we are thirteen seasons later, and the Predators are as fiscally healthy as they’ve ever been, and are once again one of the top tier teams of the highly competitive Western Conference of the NHL. And this Saturday’s game against one of the NHL’s oldest and proudest franchises, the Montreal Canadiens, marks the 1,000th regular season game for the Preds. The franchise, which went through some frustrating times with changing ownership and rumors of a possible relocation five years ago, have not only weathered that storm, but have come out all the stronger on the other side. This is primarily due to a committed local ownership group, amazingly loyal fans, and a core of exciting (mostly homegrown) one-ice talent that has fostered a winning environment. And at the center of all of this stands the only Head Coach the Predators have ever known, Barry Trotz, and the sole General Manager in the team’s history, David Poile. Together they have formed one of the best leadership tandems the NHL has to offer. These two have steadily improved the Predators success on the ice during the formative years, consistently winning more games each season than any prognosticators could’ve predicted. Simultaneously they built a strong scouting and minor league system that has developed most of the Predators players, making up over 85% of their current roster, the highest percentage of any team in the league. And once the Preds started making the playoffs in 2004, they have been back to the tournament for Lord Stanley’s Cup six of the last seven years (only three other franchises in the league can say that). Most Predator faithful have come to take Trotz and Poile for granted, but here is an interesting stat to put things in perspective: Since 1998, the other four teams in the Central Division have had a combined twenty-three different coaches and eleven General Managers. Preds fans have been a vocal lot in supporting their squad. In those first four seasons, despite little hope of making the playoffs, they filled the arena at a 94% capacity rate, earning the reputation as one of the loudest barns in the world. Then there was a lull when the uniqueness factor started to drop off and the average dipped to 79% for three years. But as the team began building into a regular playoff participant, the percentage grew back to 88%. And now, the past two seasons, it is returning to the 95% range, with sellouts occurring more often than not. And the rabid enthusiasm of these fans has helped the Predators consistently place in the top three across the league in home won-loss record for the past five seasons. It is a mutual admiration society, with players regularly commenting how they feed off the intense energy brought into the confines of Bridgestone Arena every time they take the ice for another battle. It is therefore appropriate that when the Preds take on the stalwart Canadiens this Saturday evening at 6 PM, it will be the featured game on Hockey Night In Canada broadcasts across that entire nation on the CBC. And, it will be yet another opportunity for the Predheads of Nashville and the core of young talent on the ice featuring Rinne, Weber, Suter, and Smith can show all of those hockey purists north of the border that Smashville, just like Trotz and Poile, is here to stay. Let’s let them see and hear our Predator Pride throughout the night, and give them a glimpse of the next 1,000 games with all the grit and drama that will be needed as we strive together to bring the Cup to Hockey Tonk. I'll be heading over to Palestine in March of next year for a peace conference to learn more about how better communication is leading towards reconciliation in this hotbed. The writings of Stephen Sizer have been helpful in me gaining a more rounded view of the situation, and I'm looking forward to meeting him at this event. Stephen is the vicar, or senior pastor, of Christ Church, the community church of Virginia Water in Surrey, UK. He is the author of three books, In the Footsteps of Jesus and the Apostles, (Eagle, 2004) Christian Zionism: Roadmap to Armageddon (IVP, 2004) and Zion’s Christian Soldiers: The Bible, Israel and the Church (IVP, 2007). He also writes occasionally for various journals and magazines. He has an extensive international ministry, teaching regularly in churches, seminaries and universities in the USA, Africa, Europe and the Middle East.